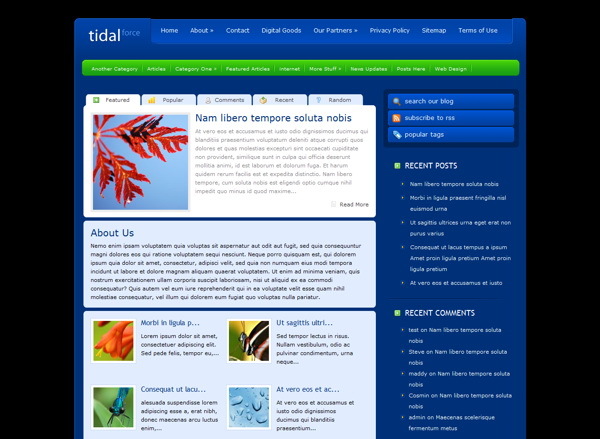 Tidalforce features a smooth blue design, that while packed full of features, remains modest in its display. This theme comes with a large array of options which can be used to edit the look and feel of your design straight from the wp-admin control panel. Designing and organizing your posts has never been easier. With our large collection of shortcodes you can create beautiful and complex layouts with ease, greatly improving the functionality and variety of your content. This theme has been localized for easy translation. Using the theme’s MO and PO files, you can quickly translate the design without having to hunt through the theme’s PHP files to change each word.